While growing up, I have always thought potato was a boring food. My mum used to fry/boil it for us. When I travelled, my offered offered me a baked potato recipe and I refused it. She insisted and I gave in (Not like I had a choice). I ate it and fell in love. I had to tell her to teach me some baked potato recipes. So if you want to know these recipes, continue reading! 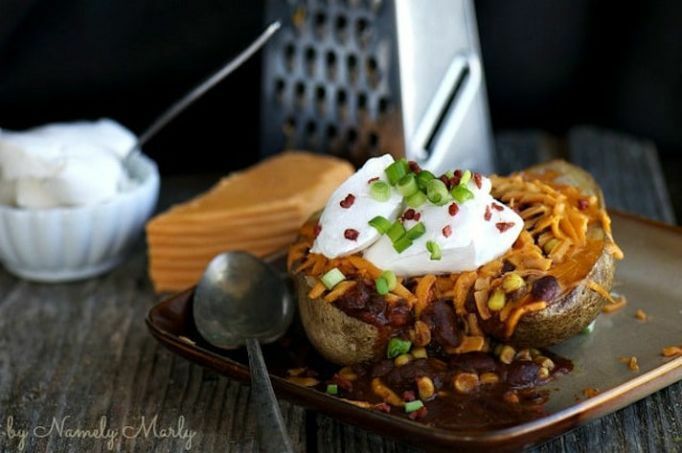 Below are 5 healthy baked potatoes recipes that would change your view on potatoes. Instead of beefy chili, opt for the meat-free bean version. You’ll also need vegan cheese and sour cream (or yogurt!) for these vegan baked potatoes. You don’t need to wait until summer to stuff a baked potato with grilled veggies and sausage—fire up a stovetop grill pan or just roast your vegetables while the potatoes bake instead. 3. Healthy Loaded Baked Potatoes: What makes these healthy loaded baked potatoes a great dinner choice? Cottage cheese, vegetables and just enough bacon to make everybody happy. 4. Southwest Loaded Potato Skins: OK, so these Southwest loaded potato skins do have cheese and bacon, but they’re also loaded with veggies and fiber-rich beans. The beauty of these breakfast potato boats is that you can really use whatever breakfast fillings you have on hand. Omit the bacon if you’re not into it or add something like salsa and black beans to give the boats a new spin.